For a while, people were trying to “gamify everything”. Or maybe there has been a push to “-ify” our lives. We “Shopify” our online stores and “Googlefy” our office spaces. We think that by making nouns into verbs we are simplifying our lives. The problem is that we have started to lose our understanding of what some of these words truly mean. Gamify is not the right verb to describe making everything in your life a game. It suggests fun and playfulness, but to gamify something is very different than developing a good game. What many people do not realise is that there can be an insidious and manipulative undertone when we gamify something. Simple mechanics like reward points associated with purchases is a form of gamification; FaceBook “likes” on the post you made about your cat’s birthday party is a form of gamification; a Fitbit step-challenges with your friend in a different country is gamification; the weekly Grammarly statistics I receive is a form of gamification. But to really understand gamification, it is important to know what a game is. A game is a structured form of play that has specific goals, rules, a feedback system and that players undertake voluntarily. Games are usually played for enjoyment but can include embedded learning. Games provide intrinsic motivators and these motivators are the hooks that help you learn and make you want to play the game again. While this isn’t a blog on human happiness, it could be, because the key intrinsic motivators that get people out of bed in the morning are all embedded in a good game. People are looking for purpose, in a game, this is often a “win” scenario. People want autonomy and the ability to make decisions that will impact outcomes. And people want mastery, to get better at something through feedback and opportunities to practice. 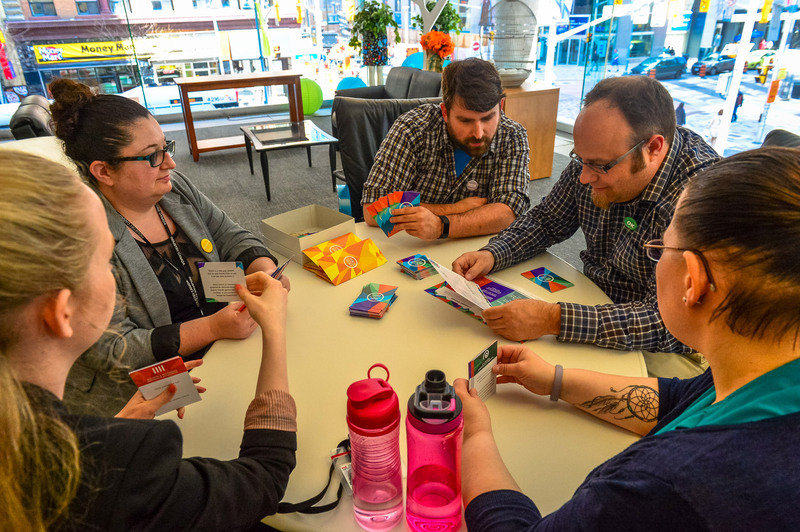 Like life, some games have an element of chance, but a good game will allow a player to use the feedback they receive during play to make choices that will improve their outcomes, regardless of the roll of the dice. Serious games are games that use fun to motivate people to do something they would not normally do. As a game, they must incorporate goals, rules and feedback, but a serious game has a goal that includes something other than just entertainment, enabling players to discover their own insights. Serious games use experiential learning that has meaning for the player and provides an opportunity for mastery. A serious game should be just as fun and engaging as the games we buy at the store, calling it a learning tool should not be an excuse for making a bad game! A bad game is one that is overly complicated for no reason, is purely chance based, has ill-defined roles or rules, or is just boring! Nobody wants boring! How is this different from gamification? In my opinion, gamification is a much more basic tool. Not only do “players” often not realise that they are playing, but the purpose is predefined by the designer and includes getting you to do something you wouldn’t through a form of bribery! How is my Fitbit step challenge not a game? I know the purpose, be the first to take 10,000 steps in a day, but I do not have true autonomy, someone else has decided that 10,000 daily steps are the best way for me to get in shape. Moreover, what can I master through this experience? Can I learn to walk better? You could argue that I can become healthier, but that is not a skill that is mastered. Instead, the Fitbit starts to help me develop habits – but once the challenges are removed, it is harder to motivate me. I stopped wearing my Fitbit for several months and stopped going to the gym! Gamification can help set habits. Once my grocery store stops offering me points or makes it hard for me to redeem the points for something I find useful, I am more likely to start shopping somewhere else. Moreover, in gamification, the designer decides what is best for you or the habits that benefit them – shopping at one store over another has no intrinsic value to you as a consumer but it does have extrinsic value (free groceries)! This is where the manipulation comes in. This is bribery. This is a simple equation of “if you do X, then I will give you Y”. When I started down this path as a game designer four years ago I barely knew what a game was, let alone that there was a difference between gamification and a serious game. Many people still use these terms interchangeably (or use the term “serious game” to justify a boring game). When I started, I had never seen the power of learning through interactive games or how manipulative I can be by gamifying something, but a lot happens in four years. This is a game for me. I want to create spaces for people to come together and unpack complicated and emotive issues (purpose). I now run my own business and make decisions about projects I will take on and how to deliver them (autonomy). And I design both games and gamified experiences, learning what people like and how to iterate and improve interactions with each new game (mastery). I win my game when I see people understand something they didn’t before or feel safe to have a conversation that is uncomfortable or taboo.